The Tennant T500/T500e floor scrubber provides consistent results while lowering over all cleaning costs. It has a compact design yet is durable enough for daily industrial use. It is perfect for businesses small and large – retail shops, restaurants, grocery stores and warehouses. With a variety of brush sizes and styles up from 26” to 32”, the T500 can clean up to 25,000 square feet per hour. Dual Disk – available in 26”, 28”, 32”, dual disks allow you to swap brushes around in order to help extend their life. Cylindrical – available in 28”, cylindrical brushes work well at picking up loose debris through method of passing the waste into a debris hopper before it reaches the vacuum. Orbital – available in a 28” rectangle, moves in a slight circular motion and allows for chemical-free floor finish removal, ex. removing wax from VCT tile. 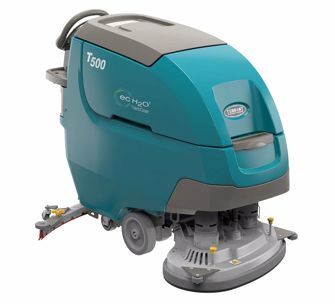 The T500 is a battery-powered floor scrubber with rechargeable batteries but adding the Smart-Fill Automatic Battery-Watering system means no more manual checking and filling – no more accidental overflows! Ec-H20 Nano Clean turns water into a chemical-free cleaning solution. IRIS Asset Manager lets you monitor your machines costs, trends and receive service notifications. Pro-Panel LCD Touch Screen hosts on-demand training videos, pre-configuration permissions, battery charge indicator, and more – all in 28 languages! Scrub path: 26", 28", and 32"
Battery run time: 5 hrs.